Not that bright a day today, but much warmer than it has been here in France lately (it seems Europe is experiencing an extremely cold winter this year) and so I decided to go for a walk. While the Paris area is quite urban, there are a few very large parks on the edges of the city, and as we are located in Sevres, I chose to go wandering in the Parc de St. Cloud. I started slowly up “Cactus Killer’s Hill” as I affectionately call the steep hill through the streets of Sevres that leads to the gated park entrance. “Cactus Killer” goes running up here all the time, and the first few times i ever came up this hill I thought I would have a heart attack! But in fact, as long as I take it slow, it is a good work out, and the “reward” is the parc itself. Situated at the top of the hill this parc is similar to other French gardens, which are landscaped on an architectural plan, with long clear alley’s between militarily upright columns of shade trees. But this park also covers some more naturally wooded areas, between the beautifully landscaped squares that look like picture postcards touting the magnificece of 18th century France. I wasn’t looking for that kind of walk though. I was looking for something a little more “nature”-oriented, and so I picked up one of the jogging paths thru the wooded areas (not that I was going to jog), and walked at a leisurely pace. The ground was muddy from the recent snow melt. As I made my way along I gazed up at the trees, their bare branches black against the grey sky. And then I saw him. He was on a small branch not very high up a rather skinny tree. A tiny Red Squirrel. It is the first time in my life that I have ever seen one (though I knew they were in this Parc, as “Cactus Killer” has seen them from time to time). “Mr. Red” saw me watching him, and he stopped nibbling, and stared back. He was small compared to “our” grey squirrels, and his ears were larger, and pointier, and his fur seemed longer, his tail more “wispy.” He seemed “delicate” compared to the big clumsy greys at home. We watched each other for a little while, and though other people passed, they didn’t notice him, and he didn’t pay them much attention either. I tried to make a picture, but as I only had my iphone, I couldn’t get close enough, and as I moved slowly nearer his tree, he ran to the safety of a larger tree nearby. He circled around and peered at me from behind the thick trunk on the otherside. Within a few minutes he determined I was not really a threat and went back to his original branch and continued eating. I returned to my walk, feeling privileged to have seen Mr. Red. 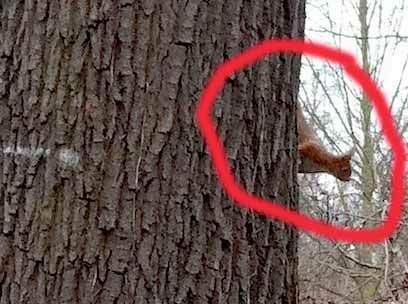 Unlike our grey squirrels, the reds are shy and hide from people, so seeing one is rather rare for occassional park visitors. Following the “usual” path, I headed to the overlook where I could see the entire city of Paris across the river. The grey sky hung low over the city, casting it all in the same shade of grey — the grey of Paris winters. I decided to keep walking and randomly chose a path I had not taken before in a direction I was unfamiliar with, back into the more wooded area of th e park. Looping around once I got to some kind of formal garden complex on the other side, I returned in the general direction “back”, and as I was almost out of the treeline and back into one of the giant “alley” ways, I saw some movement in the leaves at the edge of the woods. I couldn’t believe my luck. It was another red squirrel! This one was more cautious and ran high up in the branches of the first tree he could reach. Then he stopped and watched me. I stood for a little while, thinking he might come back down, but he didn’t budge. As I continued my walk, I saw him jump to the next tree and take up a position on a high branch. I crossed the wide grassy alley way, and picked up the path on the other side of the columns of bare trees, and as I walked I looked across and I could see him accompanying me. He jumped from branch to branch as I walked, and when I paused he stopped. He was so graceful jumping across the treetops, and so small you could almost think he was a bird, if it wasn’t for the unmistakeably bush tail. That little red squirrel “escorted” me, paralleling my walk the whole length of the alley way, before stopping and disappearing deeper into the treeline at the edge of the intersecting paths, where I turned left and away from the big alley and back towards home.